Chosen by Amazon as the Best Book of the Month for December 2018 in Biographies & Memoirs, History, and Nonfiction. From the author of the New York Times bestselling and award-winning Not on Our Watch, John Prendergast co-writes a compelling book with Fidel Bafilemba--with stunning photographs by Ryan Gosling--revealing the way in which the people and resources of the Democratic Republic of Congo have been used throughout the last five centuries to build, develop, advance, and safeguard the United States and Europe. The book highlights the devastating price Congo has paid for that support. However, the way the world deals with Congo is finally changing, and the book tells the remarkable stories of those in Congo and the United States leading that transformation. The people of Congo are fighting back against a tidal wave of international exploitation and governmental oppression to make things better for their nation, their neighborhoods, and their families. They are risking their lives to resist and alter the deadly status quo. And now, finally, there are human rights movements led by young people in the United States and Europe building solidarity with Congolese change-makers in support of dignity, justice, and equality for the Congolese people. As a result, the way the world deal with Congo is finally changing. Fidel Bafilemba, Ryan Gosling, and John Prendergast traveled to Congo to document some of the stories not only of the Congolese upstanders who are building a better future for their country but also of young Congolese people overcoming enormous odds just to go to school and help take care of their families. 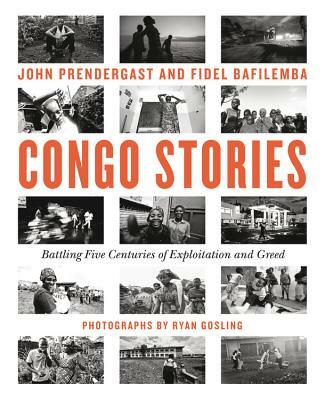 Through Gosling's photographs of Congolese daily life, Bafilemba's profiles of heroic Congolese activists, and Prendergast's narratives of the extraordinary history and evolving social movements that directly link Congo with the United States and Europe, CONGO STORIES provides windows into the history, the people, the challenges, the possibilities, and the movements that could change the course of Congo's destiny. Ryan Gosling is an actor and filmmaker. John Prendergast is a New York Times bestselling author who founded and runs both the Enough Project and The Sentry. Fidel Bafilemba is a Congolese field researcher who coordinates a civil society network called GATT-RN.